Instrument design is an evolutionary process. We have increased the range of standard fretted instruments (mandolin, mandola, cittern and bouzouki) over the years to reflect, not only our interest in innovation, but also the needs of musicians. Within our different ranges, with their distinctive appearances and sounds, you will find the instrument that is just right for you. Coming soon, more details of our new Cirrus range. We developed the Teardrop range of mandolin family instruments as we became aware of a need for a good quality instrument costing less than our Original models. We achieved this by using a simpler design with no frills that is quicker and easier to make. This has reduced manufacturing costs while maintaining our usual careful workmanship and attention to detail. Like all our other instruments, every Teardrop is of all-solid construction and has only high quality components. This range will appeal particularly to the session player. The instruments have a bright, full sound that projects well. We liked the sound produced by a teardrop so much we went on to develop some enhanced models! They are now available in figured sycamore, rosewood and imbuia, with spruce or western red cedar soundboards, ebony fingerboards and Schaller machines. A further development of the teardrop design, this instrument (currently only available as a mandolin) has a deeper body, giving more bass response, but still with the distinctive cut. Spruce soundboard, figured sycamore back and sides, rosewood fingerboard and high gloss finish. We applied the experience and knowledge gained from developing our range of guitar designs to the mandola, cittern and bouzouki. The Classic has a larger body size than the Original, guitar-type bracing for the soundboard and a guitar-type, pinless fixed bridge. The result is a 'classic' sound - superb tone, wonderful balance, bright clear trebles and a really rich resonant bass. If you've ever played a Gibson mandolin, you'll know that special chunky, powerful, cutting sound of a carved-top instrument. We pride ourselves that our instruments sound just as good! 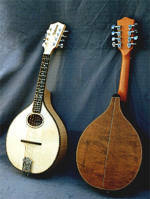 The soundboard of each instrument is hand-carved from a wedge of solid wood. 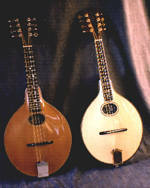 As the carved-top mandolin is the most popular model, it is the only one we keep in stock. Carved top octave mandolas, bouzoukis and citterns are available to order only. Several years ago, Niall O'Callanain (www.nialloc.com), the well-known Irish bouzouki player, asked us to build a large-bodied instrument with plenty of volume and good projection. Our design solution for Niall combined the larger body of the Classic with the floating bridge and bracing pattern of the Teardrop. He was very satisfied with the end result, and we went on to develop the idea with the aim of providing a reasonably-priced large-bodied instrument. This Meridian range comprises simply-designed, plainly decorated instruments that are built to our usual high standards. If you're after an instrument with lots of volume, great projection and cut, this could be the one for you. The Original range is where we started, and has been continuously improved over the years. Each model was extensively road-tested by the experts - experienced musicians whose feedback influenced the final design. The design and construction of an Oakwood instrument leads to a full, evenly balanced tone.